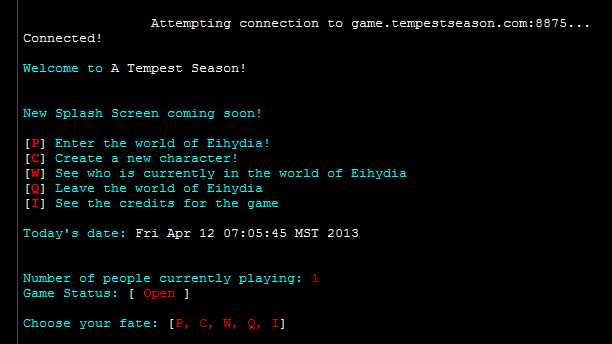 A Tempest Season (ATS) is an online role playing game. You are able to interact with anyone across the world. Connecting to the game is easy to do. 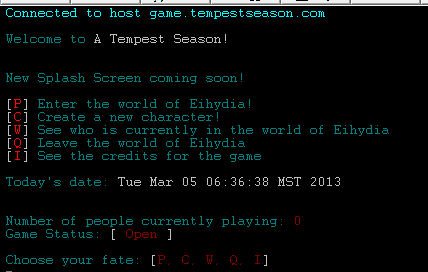 To get started, press “C” to create a new character and move onto the next section – Creating Characters. The Staff of ATS does not maintain the above website. We cannot guarantee its long term availability. While the above website will generally work for game play, there are other ways to play. There are programs made specifically for playing MUDs, called MUD Clients. These clients have special features such as saving connecting information, macros, triggers, logging (useful for keeping a history of your sessions), sounds and so on. There are several popular ones out there, including ZMud. ZMud can be downloaded at the following site: www.zuggsoft.com. You can play ATS on mobile devices as well! Search the App Store, such as Google Play, for Mud Clients. If you have any questions post on our forums or contact the staff here.